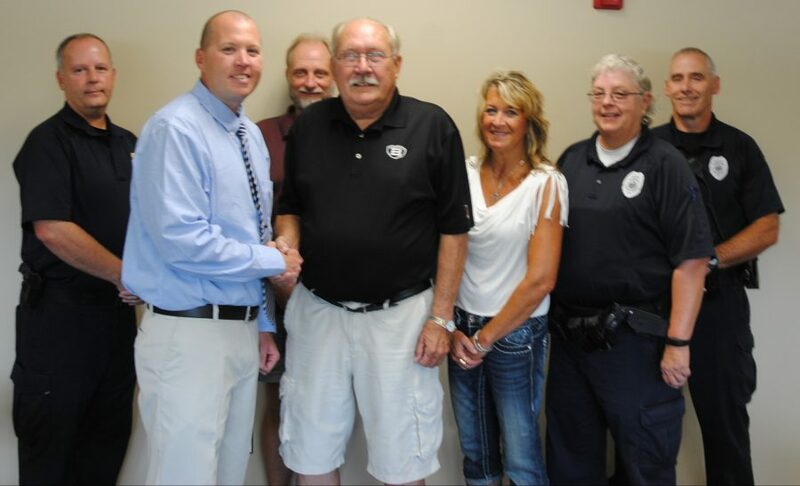 North Webster Town Council met the newest member of the North Webster Police Department, Dan Buell, at the Tuesday, Aug. 16, meeting. In front, from left, are Buell, Town Council President Jon Sroufe, Town Council Member Lisa Strombeck and Officer Candace Smythe. In back are Police Chief Greg Church, Town Council Member David Waliczek and Officer Dave May. Dan Buell had a large turnout of family and other police officers on hand for his introduction. He began duties July 30 during the Dixie Day Festival. The council heard from Jeremy Sponseller, Triad Associates Inc. It is the town’s engineering firm for the ongoing, state-mandated waste treatment project. He presented two bills for the council to approve. One was for the collection system work by Selge Construction, Niles, Mich., for $232,490.70. The other was for sewage treatment plant work by Crosby Construction, Fort Wayne, in the amount of $123,120. Both payments were approved. Webster Lake resident Richard Cowan asked the council if there are any plans for the sewer system to be extended around the lake. President Jon Sroufe answered, “Not at this time.” Cowan was curious due to the activity of the Knapp Lake Regional Sewer District and the Lakeland Regional Sewer District. Church reminded those in attendance school is back in session and to be careful of the kids walking and taking the bus. North Webster Police Department had 247 calls of service in July with the most being traffic related. Officers worked 656 hours, drove 3,380 miles and used 311.2 gallons of fuel. North Webster Town Park has had some trees trimmed and everything is going well. The next meeting of the North Webster Town Council will be 6 p.m. Tuesday, Sept. 20, at the North Webster Community Center, 301 N. Main St.